Daniel Yates was recently selected to receive the Professional Achievement Award. 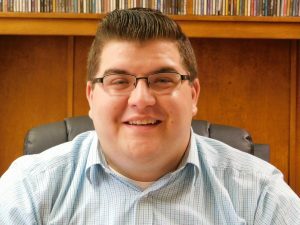 William Daniel Yates, a University of Montevallo student from Alabaster, was recently selected to receive the Professional Achievement Award for his commitment and dedication to the National Association for Music Education. Yates is an upcoming senior and music education major at the University. He and four other students across the United States were selected for the Professional Achievement Award, and the University itself was one of five schools selected to receive Chapter of Excellence Recognition. National Association for Music Education (NAfME), among the world’s largest arts education organizations, is the only association that addresses all aspects of music education. NAfME advocates at the local, state and national levels; provides resources for teachers parents and administrators; hosts professional development events; and offers a variety of opportunities for students and teachers. The Association orchestrates success for millions of students nationwide and has supported music educators at all teaching levels for more than a century.